No, this post is not about alternative personal ads. Here “MFM” stands for Meat Free Monday, a new holiday I invite you to observe. But first, Chicago. It was good to get away and explore new parts of the city and see a good friend. But perhaps the best part of all was the food, glorious FOOD! In the span of just over two days, I tried Ethiopian food (two sauce-covered thumbs up! ), had a Chicago dog (meat[?] and all), late night pizza (with S’MORES on top!! ), and most definitely the best breakfast burrito of my life at this adorable diner called Tweet (with a bellini, of course). And you’d better believe I asked Dan to take iPhone pics of each & every meal. (“She did!” says Dan Clair, nodding vigorously in agreement.) 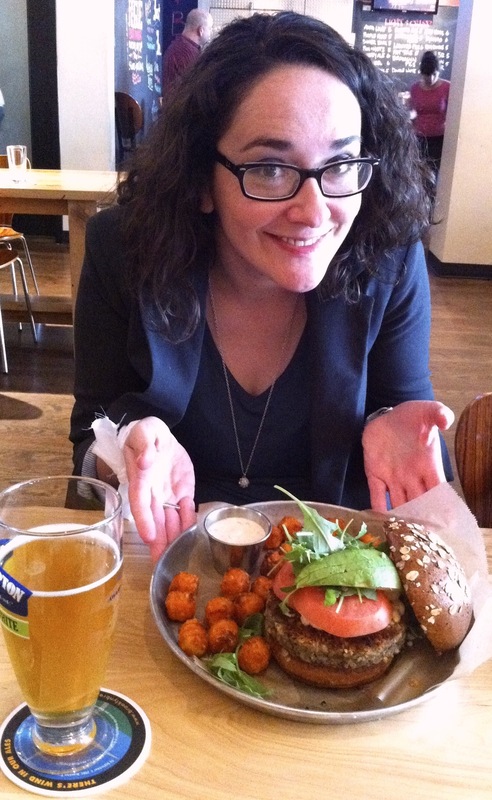 Above I’m posing with a veggie burger from the aptly named Burger Bar, and please note the sweet potato tots! We had dinner Saturday night at The Chicago Diner — an entirely vegetarian / vegan joint serving traditional diner fare. Think bacon cheeseburgers, mac & cheese, milk shakes — entirely yummy but minus the meat & dairy. Y’all it was a trip. And Dan was brave enough to forego his carnivorous ways for a meal, and he admitted it was good. Burger Bar was the following day (Easter Dinner, I suppose) and while I had my pick of all things beef and a “when in Chicago” laissez-faire vacation attitude (hence the hot dog), I chose the veggie burger because I really don’t like meat all that much anymore. I think that’s what’s missing whenever people ask about my veggie ways. They imagine what a huge sacrifice it would be for themselves and can’t really understand why I’d make such a choice. No reason seems noble enough for them to give up ground beef. From my side of the table, it’s not a sacrifice at all. I’ve heard this idea before, but read most recently about it on Gwyneth Paltrow’s blog, GOOP. The MFM movement is all about health: yours and the earth’s, and it’s about the power of simple change. Just one day a week you can choose to eat meat-free meals (and, yes, that means more than bread and lettuce). Turns out Paul McCartney is one of MFM’s biggest advocates. Seriously. Paul McCartney would like you to try Meat Free Mondays. Are you going to say “no! no! no!” to a Beatle? Didn’t think so. Yes. I am satisfied with this idea. And with Beatles-meat puns.